The Q4 2018 earnings reporting period is quickly approaching its end point with Wal-Mart’s (WMT) report scheduled for next Tuesday. So far this season, the average stock that has reported has gained 0.61% on its earnings reaction day (the first trading day following its after-hours or pre-market release). 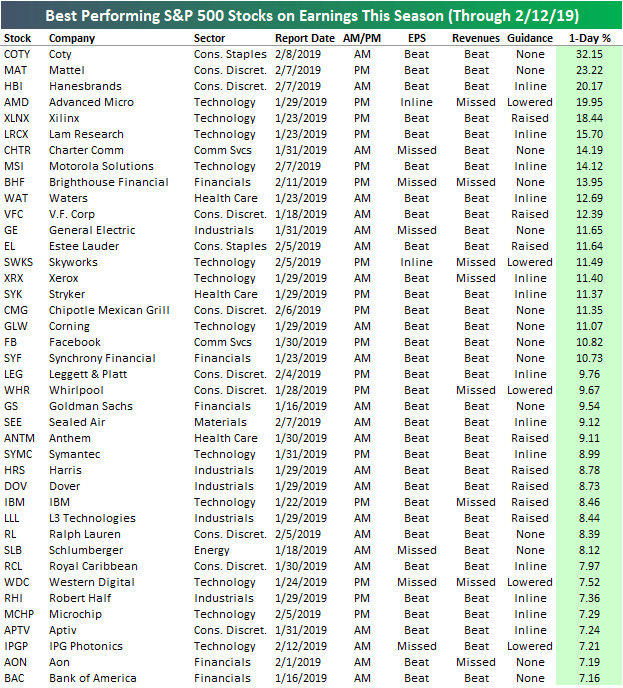 Below is a look at the stocks that have posted the strongest upside one-day returns in reaction to their earnings reports this season. At the top of the list is cloud customer service software company eGain (EGAN), which nearly doubled (+47.7%) back on February 8th after it beat both EPS and revenue estimates. EGAN shareholders certainly went home happy that night since you don’t see one-day gains of 50% very often! 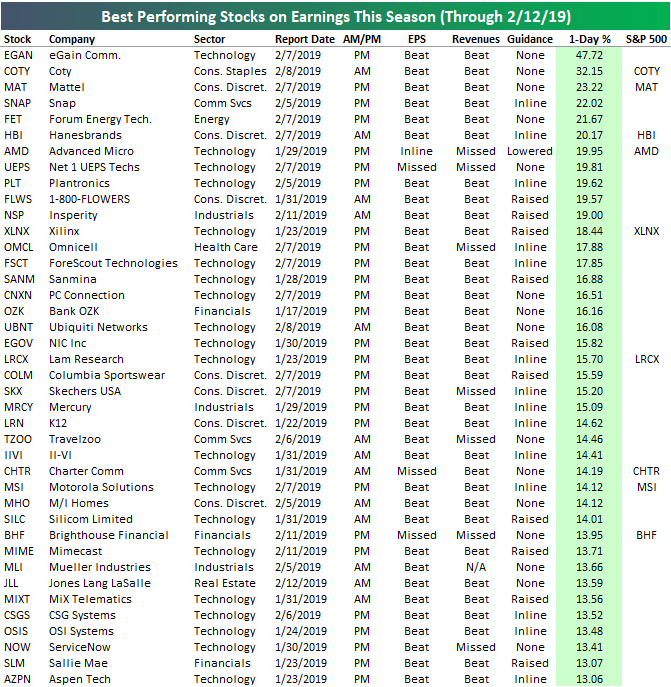 Coty (COTY) — which was mentioned positively by Bill Miller at the start of the month — ranks second on the list with a one-day gain of 32.15% after it reported before the open on February 8th. And toy-maker Mattel (MAT) has posted the 3rd strongest gain on earnings at +23.22%. Other notables on the list of big winners this earnings season include semiconductor company Advanced Micro (AMD), flower-delivery company 1-800-FLOWERS (FLWS), shoe-maker Skechers (SKX), and Mueller Industries (MLI) — not to be confused with THAT Mueller. Looking at S&P 500 stocks specifically, Coty (COTY), Mattel (MAT), Hanesbrands (HBI), Advanced Micro (AMD) and Xilinx (XLNX) ranks as the top five, while other companies on the list you’re certainly familiar with include General Electric (GE), Estee Lauder (EL), Chipotle (CMG), Facebook (FB), Goldman Sachs (GS), IBM, and Bank of America (BAC). While there’s a long list of earnings season winners, there have also been plenty of big losers. Below we show the 40 worst performing stocks in reaction to their earnings reports this season. 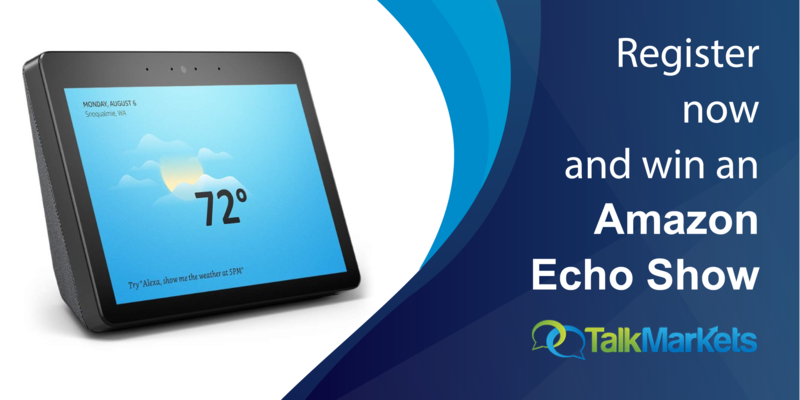 Whereas eGain (EGAN) gained nearly 50% in reaction to earnings, wireless security camera maker Arlo Technologies (ARLO) fell nearly 50% following its report on February 5th. Other notables on the list of losers include Tupperware (TUP), The Container Store (TCS), QuinStreet (QNST), Stanley Black & Decker (SWK), Take Two Interactive (TTWO), and Electronic Arts (EA). Ironically, EA fell 13% following earnings back on February 5th, but it has exploded higher to recover all of its earnings losses and then some after its new Fortnite competitor — Apex — registered 10 million users in its first 72 hours.